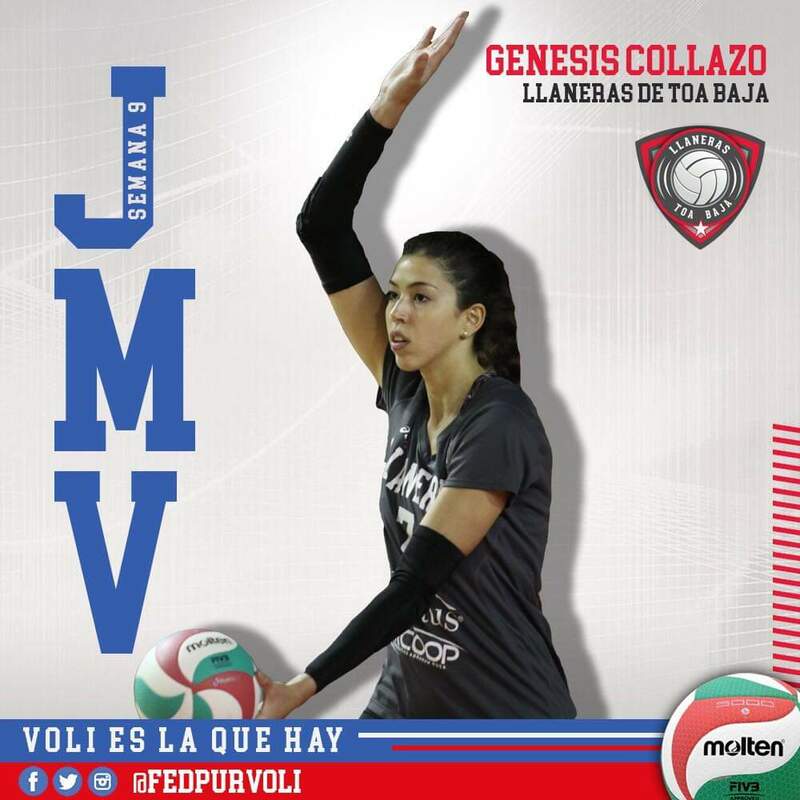 SAN JUAN, Puerto Rico, March 27, 2019 – Genesis Collazo, the opposite hitter of Toa Baja, was named the Most Valuable Player of Week 9 of the Puerto Rican Volleyball Women’s Superior League. Collazo also part of the All-Star as opposite, scored 25 and 22 points in her two matches and now is fifth in scoring and attacks with 341 points and 291 spikes. The All-Star of the week includes three players of Criollas de Caguas with Karina Ocasio as outside hitter and middle blockers Jetzabel Del Valle and Diana Reyes. Legna Hernandez of Changas de Naranjito was the other outside hitter and teammate Katherine Santiago was the libero. The setter of the All-Star was Jizzyan Gesualdo of Toa Baja. Ocasio is the new scoring leader with 402 points and Paulina Prieto of Valencianas de Juncos leads in attacks with 342 spikes. Neira Ortiz continues as best blocker with 72. Andrea Rangel of Changas is the best server with 43 aces and Kathia Sanchez of Mayaguez leads in assists with 342 sets. Legendary libero Debora Seilhamer is the best defensive player with 491 digs and 407 receptions while leading in effectiveness among players of her position with 11.23 percentage.